The 35 meter long “The Phinisi” is the newest addition to Thailand liveaboards The Junk family. She is a 140-ton three mast phinisi taking 18 guests on board in seven cabins. She visits Similan, Koh Bon, Koh Tachai and Richelieu Rock with trip lengths of five-days and four-nights or seven-days and six-nights. She will also offer seven and 10-night Mergui Archipelago itineraries. She’s a classic Southeast Asian slice of history. She carries plenty of fresh water and fuel to enable her to easily conduct week-long Thailand liveaboard scuba diving itineraries. Guests dive from two rubber tender RIB dinghies for safety and comfort. She carries safety equipment for safe passage at sea including first aid kits, Oxygen, a DAN oxygen kit, two SOLAS life rafts, and SOLAS life jackets. Her communication gear includes VHF radios, CB radios, a GPS, radar, echo sounder and mobile telephones. She offers Nitrox. She has both indoor and outdoor comfortable saloon common areas. You’ll be served five meals and snacks per day on board. 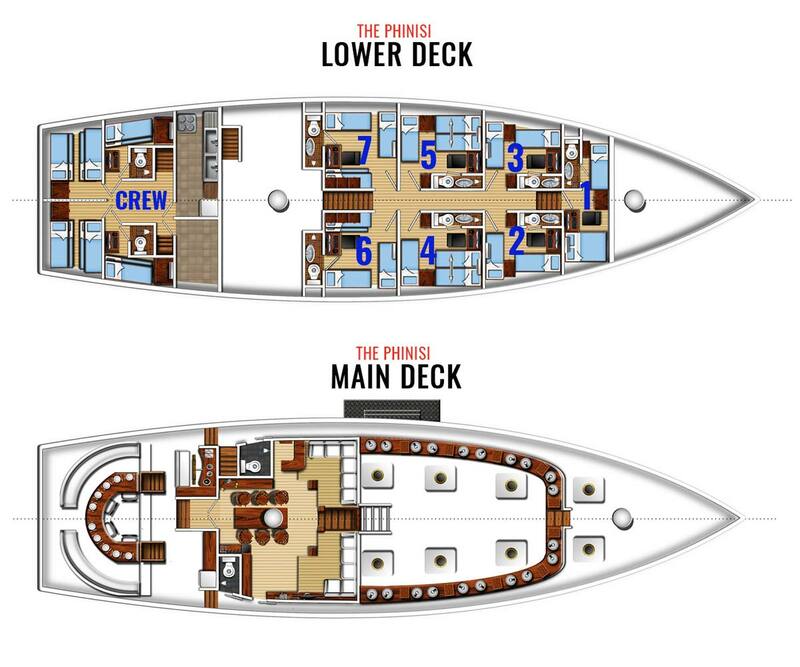 With a total of seven cabins from stem to stern, The Phinisi Thailand liveaboard has one cabin with a double bed and a twin bed, two fixed twin-bed cabins, two convertible double or twin bed cabins with three beds and two quad twin bed cabins. All of her cabins are fully air-conditioned and have their own hot water shower and en-suite bathroom. The Phinisi Thailand operates in Thailand from October until May each year. Similan, Koh Bon, Koh Tachai and Richelieu Rock itineraries are six days in length. She offers a four-day Southern Island itinerary to Phi Phi and Hin Daeng, and will operate seven and 10-day itineraries to the wonderful Mergui Archipelago in Myanmar. She is available for individual bookings as well as charter cruises. Individual prices are listed below in the schedules. Please contact us for charter prices. All departures are from Phuket, Thailand, serviced by Phuket International Airport. The vessel departs from either Chalong Bay in Phuket, or Thap Lamu, the port just north of Phuket. Transfers are free to and from your hotel or the airport to the boat on departure day. Custom-built for diving in 2007 in Indonesia, “The Phinisi” (pronounced pinisi)–which is a local boat type unique to Indonesia–has a interesting history. When she was launched, she was given the name ‘Sampai Jumpa Lagi’, which means ‘See you again’ in Bahasa Indonesia. She started her career operating dive liveaboard cruises to the Similan Islands and the Mergui Archipelago in Myanmar from 2007 to 2009. The yacht was then renamed ‘S/Y Siren’: the first ever yacht to bear the name of what has over time become the famous Siren Fleet. She diverted to offer dive cruises in other wonderful destinations, such as Komodo and the Andaman Islands, on top of her existing trips. In 2011, she relocated to the Maldives where she was given a new name: Maldives Siren. She successfully operated liveaboards around the Maldives atolls until 2014. After leaving the Maldives and returning to Phuket, she was renamed yet again and became ‘Cheng I Sao’. Cheng I Sao was a legendary fearless female Chinese pirate roaming the Andaman Seas. Cheng I Sao took her guests to the best snorkeling sites on daily cruises, serving lunch and/or sunset dinners. As she has been missing her scuba diving guests, she was reconverted to a liveaboard and named The Phinisi in par with her sister ship, The Junk! Transfers to Hotel or Airport. Please note: Approximately 14 dives. Itineraries are for general information only. We make no claims to being 100% accurate as there are too many factors affecting the schedule. We will give you the best diving on the best spots we can each day. Please note: Approximately 19 dives. Itineraries are for general information only. We make no claims to being 100% accurate as there are too many factors affecting the schedule. We will give you the best diving on the best spots we can each day. Here you can define the content that will be placed within the current tab. Departures can’t be confirmed immediately as availability changes by the hour. We check to make sure the departures and cabins you prefer are available. We then hold them for 48 hours to give you a chance to book the trip. Booking is easy and credit card payment is secure through our merchant account. There is no obligation to purchase trips at this time. Your information will not be stored or shared. Our fairly regular, occasionally interesting newsletter. Since 1990. Siam Dive n' Sail Co. Ltd.